Rare Partial Nest of Five Oviraptor Dinosaur Eggs. 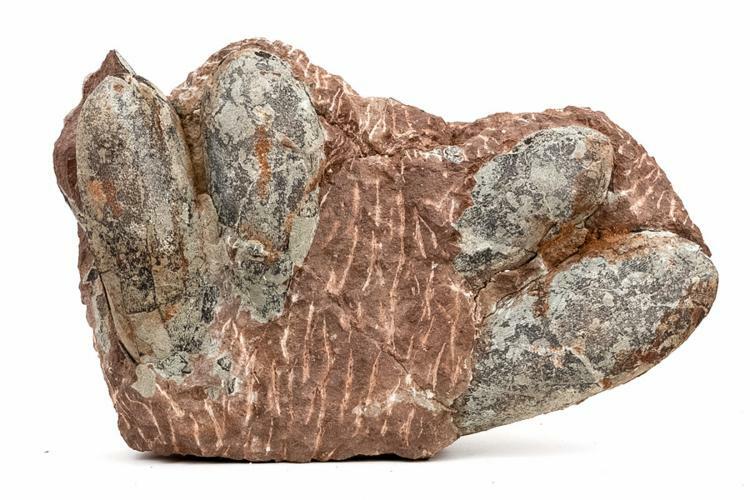 This original partial nest of four nearly-complete eggs with some parts of these eggs still buried in the matrix and one partial egg are 70-80 million years old, found in the Gobi Desert. These 6.5 - 7 inch long eggs belong to the largest of the two Oviraptor species named Citipati. Citipati Oviraptorids were made famous by the nest of eggs with the mother Citipati sitting on top of the eggs in a brooding position. It was revolutionary to discover a dinosaur sitting on top of its eggs like a bird. Only later was it discovered that Oviraptors also had feathers like a bird. Citipati eggs are ratite in texture and have a very thin shell, which is why they are rarely found complete. This original partial nest containing four eggs over 6.5 inches long with 60-80 percent original shell and one partial egg beneath the four eggs show that Oviraptors laid their eggs in concentric circles of up to three layers of eggs. These rare partial nests are only available when old collections become available.